When the first elliptical machine was introduced on the market, which was from Precor, I purchased one for the corporate fitness center where I worked. Immediately, the members fell in love with it. Soon after, we had to purchase two more because there were daily fights to get on it. They rarely broke down or gave us any trouble, that is why I purchased a Precor treadmill for my home. Yes, they are, but they will last many years without trouble. I bought my treadmill on sale for $1800 seven years ago and it hasn't given me any problems. In fact, I told my husband that we should have it serviced because it probably needs a tune-up. Three of my clients have Precor ellipticals. I have been training them over 5 years and their machines have been running flawlessly. They also need to get them tuned up but I will check on that to see if it's needed. My motto is cheap can be expensive. For a big ticket item, like a treadmill, elliptical trainer, or a stepper, you don't want to buy something for it to break down in 2 or 3 years. It's not being frugal. If you are looking to purchase a treadmill, bike, elliptical, or weight machines, check out the catalog online. Remember to look under home equipment, not commercial equipment. 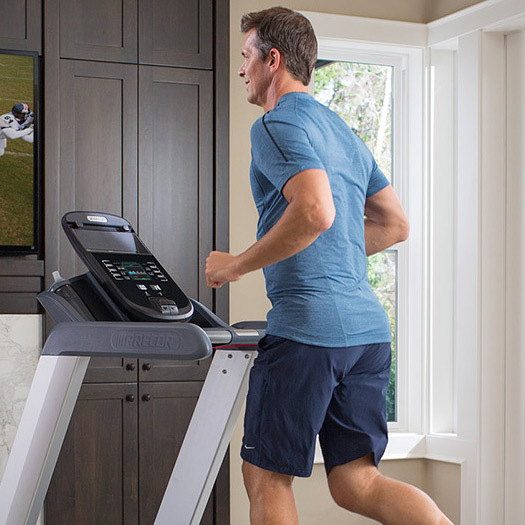 Do you have a Precor treadmill or elliptical trainer? Ann that's good that you got a good treadmills. It will last you for years to come. We definitely need one of these in the house. Thanks for sharing. We will definitely look into this. I haven't tired one, although I may have some years ago at a gym. I love the motto 'cheap can be expensive,' as I have found that to be almost invariably true. This looks like a product I would really want - although I wonder about my knees if using it all the time would be good for them.